What Komen for the Cure’s cowardly capitulation to Rep. Cliff Stearns means for the future of breast cancer and the preservation of lives. 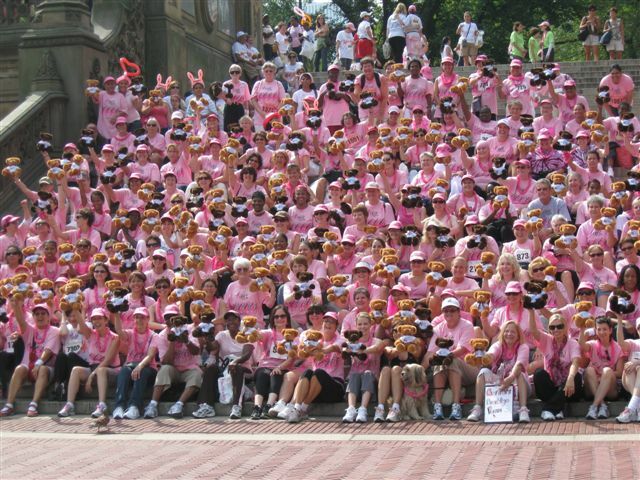 It is estimated by The American Cancer Society that 39,510 women will die of breast cancer in 2012. But the death rate, as severe as it is, has plummeted considerably since 1990 — in large part because women were screened at an early stage. One clinic these women went to was Planned Parenthood, which conducted 747,607 breast exams (PDF) (or 14.5% of its total services) during the year 2010. You’d think these great dents to a serious threat would be celebrated by politicians of all stripes as an American innovation. Breast cancer is nonpartisan. It doesn’t care whether the victim is Republican or Democrat. But the politicians would rather paint the town red with their twisted tales. Newt Gingrich has recently pledged to defund Planned Parenthood by 2013, conveniently omitting the fact that the organization isn’t just about abortion. He said that he would rather use the money “to promote adoption and other pro-family policies.” But how is family unity bolstered by restricting the ways in which women get screened? Gingrich is right about one thing. If the blessed matriarchs of his twisted Handmaid’s Tale fantasy have dropped dead from breast cancer, then someone will certainly need to spring for the adoption costs. The anti-abortion, pro-breast cancer screening type may well ask why an “abortion mill” like Planned Parenthood should be funded at all. Well, it’s the same reason why Big Mac haters occasionally dip into a McDonald’s for the addictive fries. If the previously cited breast screenings aren’t enough for them, what of the pap smears, the prenatal care, the diabetes screenings, the STD testing, the male infertility screenings, and the menopause help? Even if we confine Planned Parenthood’s acceptable services to breast screenings, consider the many free exams that Planned Parenthood has offered, including gratis screening in Boise last June. Financially strapped and uninsured women were able to get the needed treatment for early stage breast cancer. Komen has claimed that newly adopted criteria prevents the charity from offering grants to any organization that is under investigation by local, state, or federal authorities. This would include Planned Parenthood. The investigation which Komen is referring to involves Rep. Cliff Stearns’s probe from last September, in which the Florida Republican ordered Planned Parenthood to turn over numerous financial documents at considerable inconvenience. But as Reps. Henry Waxman and Diana DeGette responded, “The HHS Inspector General and state Medicaid programs regularly audit Planned Parenthood and report publicly on their findings. These audits have not identified any pattern of misuse of federal funds, illegal activity, or other abuse that would justify a broad and invasive congressional investigation.” It’s also worth pointing out that, last year, when an anti-abortion activist attempted a James O’Keefe-style undercover video, Planned Parenthood was quick to alert the FBI. In other words, Komen wishes to engage in kangaroo court politics whereby Planned Parenthood is deemed guilty long before the trial is done. As Slate’s Amanda Marcotte has helpfully pointed out, this is hardly the first time that Komen has played needless hardball with organizations fighting the good fight against breast cancer. That Komen’s move comes in the wake of Indiana Governor Mitch Daniels signing a bill last May cutting all government funding to Planned Parenthood in his state is fitting. With one draconian sweep of his pen, Daniels refused to consider how federal law already prohibits federal funds from being spent on abortion, as well as the fact that abortion accounts for only 3% of all Planned Parenthood services. Much as Daniels’s preposterous and self-serving effort to woo hard-line conservatives was a redundant piece of legislation unfairly singling out a group providing vital services, Komen’s turncoat tactics are equally callous in the way organizational image has been prioritized over human lives. The Komen capitulation is a disgraceful deracination, a move more attuned to Afghan moral crimes than a country predicated on separation of church and state. It’s a giant gob of spit dripping down the graceful face of a courageous woman who found hope and humor as she was dying and who longed for other women to live. Under the current Komen regime, these noble ideals have evaporated. The time has come to seek more courageous foundations and win the war against breast cancer. As a breast cancer survivor and a feminist I am very disappointed in their move to cut ties with Planned Parenthood. For someone who is concerned about women’s health, I would have thought this organization would be a supporter of all women’s health issues. I will let other of my breast cancer friends know of this decision. Our family is glad to hear this. Most people have no idea who planned parenthood is, or it’s roots. Margret Sanger, the founder of planned parenthood, gave them their business design. In her own words, she called for population control of blacks. I’m more white than sour cream, but I happen to be one of the few people who don’t support racial genocide. Check out the 180 movie on youtube to get an idea of what Planned parenthood does. Also worthy to note, they got busted again.. Your WP link says, “But a Planned Parenthood spokesman denied that the organization claimed to offer mammograms…”, and the media matters link can only come up with two exceptions to the no mammography rule, the fact that one was a temporary “mobile clinic” does little to disprove the rule. Komen changed its position from “PP under a Congressional investigation” to the “mammogram referral” myth, which I’ve addressed above. In other words, Komen’s “explanation” changes from day to day. The full text from the Cochrane link (2) is behind a paywall, but the study appears to have relied largely on two studies involving breast self-examination vs. no intervention in Russian and Shanghai, which has no bearing on what we’re discussing here. Incidentally, the USPSTF recommendations are as follows: (1) It recommends a mammography every two years (instead of every year) for women ages 50 to 74. (2) It is still looking into clinical breast exams. This is what’s known in science as ongoing study. (3) It recommends against breast self-examination (but not necessarily clinical exams). I am not a medical expert, but from what I understand, the USPTSF is typically very conservative when issuing material, which is intended as reference, but not a specific clinical dictum.